I planned a trip with my cousin Biren. I talked with Joel and he helped me to book a hotel. We left for Udaipur on 25th Jan at night by Bus. We reached Udaipur in Morning by 8 am on the second day. The bus dropped us at Udiapole circle. We searched hotel location on Google and found a distance from Udiapole is around 2.7 km. It was raining in the morning at Udaipur which we never expected and it took us by surprise. We decided to walk to the hotel. It took around 30 min and we reached the hotel at around 8:45 am. We reached early and check in time was 11 am. The hotel has rooftop restaurant and it’s opened so we decide to stay there until getting the room. The hotel is near to Lake Pichola so lake view is awesome from the restaurant. We had breakfast and it was good. During the breakfast, we planned to visit two temples, Shrinathji Temple (Nathdwara) and Eklingji Temple. We decided to go there by Bus. After that, we checked in and freshened. We took rest till 2 pm. After that, we went outside and tried to find Govinda’s Cafeteria as one of Biren’s friend suggested. Govinda’s Cafeteria was near to Jagdish Temple. We had lunch (Paratha and Hot chocolate) there. After lunch, we went to Udaipur Bus Station at Udiapole. We got bus very soon. We enjoyed the bus ride as well as the view of many beautiful places. It was a little cloudy but overall good weather. The temple was about two kilometers away from the bus station. We decided to walk and saw many people at the temple. We bought a dessert, Khaja, to take back home. After that, we went to Eklingji temple. We reached to temple at the time of Aarti. We attended Aarti and it was a joyful time. From there we got the bus back to Udaipur. We went to the hotel from the bus station and met Sanket who came from Pune for WordCamp Udaipur and stayed with us in same room. Sanket is my friend from college and also work together at rtCamp. Also, we met Abhishek Deshpande and had a chat. We together planned for the second day to visit City Palace, Udaipur, Fateh Sagar lake, and other nearby places. On the second day, first, we visited City Palace, Udaipur. It’s a beautiful palace. For lunch, we went to Krishna Dal Bati Restaurant to eat Dal Baati. That restaurant is very famous for Dal Baati. After lunch, we met Ganesh and Gagan. We together went for a boat ride at Lake Pichola. After that, we went to Machla Magra Hills by ropeway. See the entire Udaipur city and the view were really awesome. Also visited Karni Mata Temple. We stayed there until 7 pm, then went down by ropeway. For the dinner, we went to Biryani House near to Chetak Circle. Although the restaurant is famous for non-vegetarian food, vegetarian food is also available. After dinner, we went to Fateh Sagar Lake. We had cold coffee at that place. Kulhad Coffee is very famous at Fateh Sagar Lake. We spent more time there. We enjoyed a lot on the second day. After we reached the hotel, I was awake till 12 am to wish my younger brother Chaitanya on his birthday. I woke up by 7 am and got ready by 8:30 am. We went all together to the WordCamp venue by bus, arranged by WC Udaipur organizers. The venue is very nice. I met many friends from Multidots who are involved in WordPress Translation. 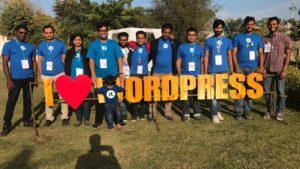 We discussed WordPress translation in the Gujarati language. Also met new people from the community. Following are some sessions which I liked most. Overall experience was good. Below are some things which made this trip especially memorable for me. Beautiful Udaipur City and some places like City Palace, Lake Pichola, Fateh Sagar Lake, Shreenathji, Eklingji, Jagdish Temples. Thanks to WC Udaipur organizers, and volunteers for awesome WordCamp. Nice one Chandra, Glad you are enjoying WordCamps! We should catch up sometime when you are in Pune. Sure, Aditya, I’ll be in Pune by next Monday.